Thomas Piketty's book Capital in the Twenty-First Century has already attracted more serious attention than any economics book published in the last 75 years. This collection of 17 essays by some of the world's most prominent economists explores Piketty's book in depth and from various vantage points. Here is what economists around the world are already saying about this book. "Marx's CapitalI is strong on theory but, its detractors allege, weak on data. In a dialectic worthy of Hegel himself, the critics assembled here argue that Piketty's Capital stands opposite to Marx's, as strong on data but weak on theory. This combination - plus its exquisite timing - explains its critical acclaim. The juxtaposition of economic stagnation and obscene inequality in the aftermath of the financial crisis made it impossible for mainstream economists to continue ignoring inequality, let alone applauding it as they have done for so long. Piketty made it possible for them to acknowledge it without abandoning their comforting but false mainstream theories of capitalism. The authors in this volume applaud Piketty for his contribution to empirical knowledge, but reject his views on how this inequality came about. The true Capital for the 21st century is still yet to be written." 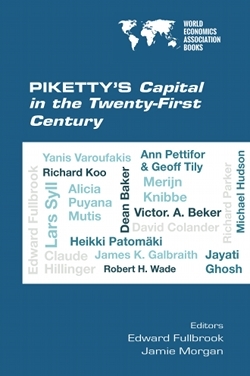 "By examining Thomas Piketty's Capital in the Twenty-First Century from different angles, the 18 contributors to this invaluable book add enormously to our understanding of inequality and of policy options for reducing it. They point to the lack of a distinction between rentier income and earned income, to the severe limits of marginal productivity theory that Piketty employs and to the utopian nature of Piketty's only suggested remedy." "Piketty's book Capital in the Twenty-First Century served the cause of drawing the world's attention to inequality under capitalism in the long haul, based on a fresh and innovative look at new evidence. This book serves that cause even better by focusing on the inadequacies of Piketty's analysis of the processes and mechanisms leading to that inequality, and, therefore, on what needs to be done to address it." "Thomas Piketty's Capital in the Twenty-First Century was the publishing sensation of 2104, focussing the world's attention on the huge and continuing growth in inequality that poses a serious economic, political and social threat to us all. In this important new book, 18 economists from Europe, North America and Asia offer sympathetic but critical appraisals of Piketty's theoretical framework, his empirical analysis and his radical policy proposals. This is not the last word on Piketty - whatever could be? - but it is indispensable reading for everyone who is interested in one of the most important challenges of our time."